I fell in love with Ballycarbery at once, felt like it was a part of me, a living, breathing thing. Perhaps it was one of those past life experiences, but I was instantly ‘at home’, and feeling quite comfortable sitting in the once grand opening of a window, now barely more than a pile of rocks. The history of the castle is piecemeal, and the castle of our story is not the first to be built on that site. There had been one before it. What you see in the photograph above is what remains of our story’s castle. 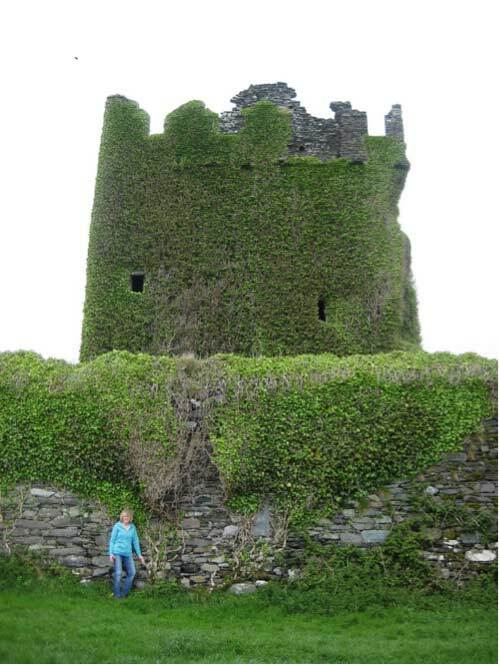 This is me, on a typical spring day at Ballycarbery castle, leaning against the wall of the bawn with the ivy covered side of the main keep behind it. The wall is very thick and has a tunnel leading the length of it, where, if one is adventurous enough and doesn’t mind creepy crawlies, one can squeeze through the narrow confines and emerge on top, just to the left of where I’m standing. Ballycarbery is introduced in Book One as the place Hank takes Laura in order to propose. Nothing of the castle’s history is brought into play until Book Four, although it appears in each of the books as it looks today. In order to learn more of the castle’s history, just put the name into any search engine and a dozen sites will pop up. 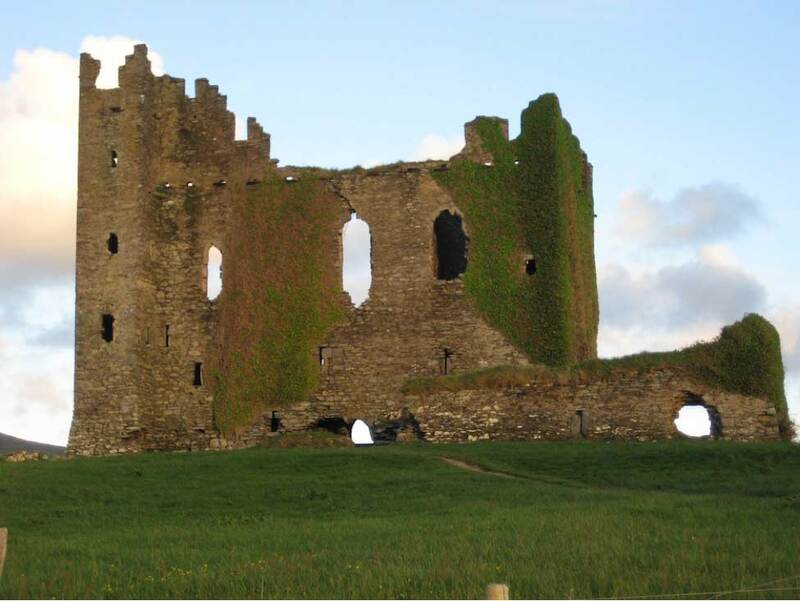 It is one of the more prominent castles on a list of things to see in Kerry, made even more special because no admittance fee is required and site visitation is possible at any time of the night or day. Everyone visiting is reminded that they do so at their own risk. Book Four introduces the castle in June 1651, the year before its demise. In early 1652, Parliamentary forces bombarded it with ‘gunshot’, (I took this to mean cannon) as great holes were blasted in the wall of the bawn, at least part of one is still visible to this day. Once inside, they blew it up, scattering rocks far and wide. At the time of the take-over, Ballycarbery was occupied by the MacCarthy Mor. His constables, the O’Connell’s, had looked after it for several of the preceeding years but by some twist of fate, which only a professor of history would be able to clarify, the MacCarthy’s took it back again during the rebellion of the 1640’s. 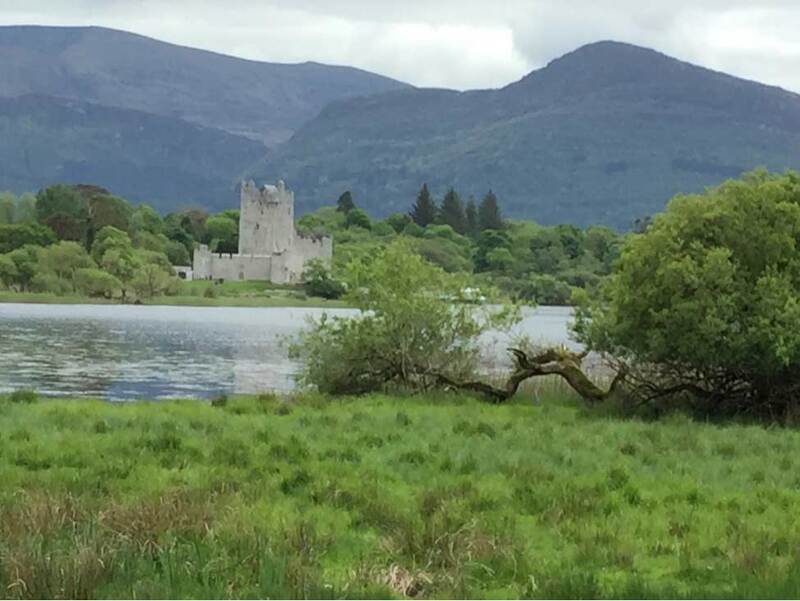 When Ballycarbery was attacked by the Parliamentarians in spring of 1652, the MacCarthy’s fled to Ross Castle, which fell on the 27th of June 1652. Since the MacCarthy’s have no more than a passing scene in my story, I have not included any more than that in my book. I have taken some literary licence and made an excuse for the O’Connell’s to be present during that final year without the MacCarthy’s in situ. For the rest, I have tried to imagine the castle as it stood, from the descriptions available, and built the story around that, keeping as close to history as I could. My apologies to history buffs and castle buffs if I have erred. Any errors of historical facts are mine alone. Ross Castle at dusk, across the waters of Lough Leane, in Killarney National Park, County Kerry, Ireland. Book 5, the final book in the series, The O’Farrell Legacy. Look for it Fall/Winter 2018. Mulligan’s Dream is now in paperback! Book 4 of The O’Farrell Legacy, A Winter Sky, is now available online! © Copyright 2017 S.M. Cross. All rights reserved.